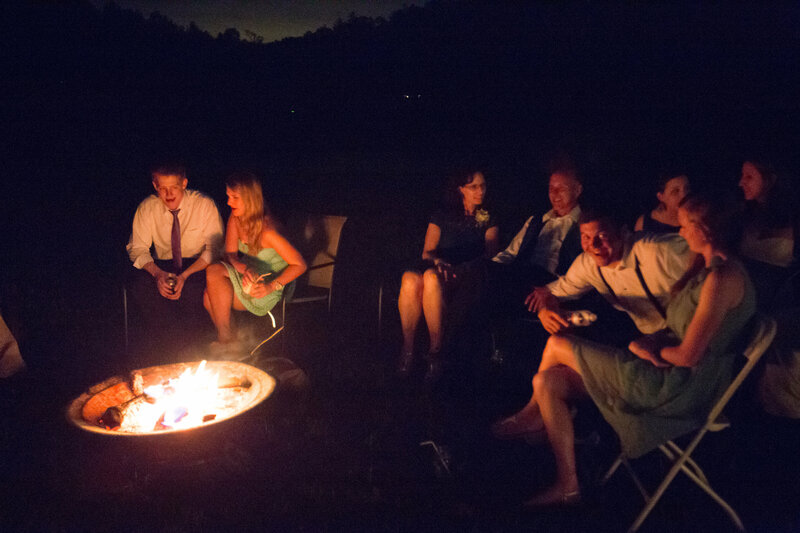 Imagine your reception on the private 60 acres estate, nestled into the hillside, or fill the Appalachian Party Barn with fun decor and musical sounds for a guaranteed fun time. Load up the beverage shed and start up the music and your reception can be everything you dreamed it might be. The Country Manor Inn is on the highest point of elevation of the 60 acre estate, and affords a sweeping 270 degree view of Southeast, North and to the Southwest. The suites are inside the Country Manor House, one is called the Octogon Suite on the ground level with ramp entrance, and a view from the North to Southeast, the other, called the Threshold Suite is on the second level with views from the Northeast to the West. Choose from among our many vintage outdoor farm and garden settings for your upcoming Smoky Mountain Dream Wedding. Choose from a natural Rock Garden, Country Hillside, Manor Veranda, or Appalachian Party Barn location. Whether your wedding is a private couple’s only wedding or a combination wedding and family reunion, we have the facility to make your wedding dreams come true. Choose from our many settings for outdoor garden weddings for your dream wedding in the Smoky Mountains. Over 50 acres of scenic beauty to select from. See the various sites and descriptive copy by clicking on “Property Map” on this site. We have special pricing packages for small elopement and destination weddings, full-scale combination weddings and receptions for up to 500 guests, priced for Saturday and less expensive pricing for other days of the week. Click on “specials” on this site to see some of our special offers. Click on “Real Weddings” and “Photo Shoots” to see the results of some of our beautiful weddings and our photographers at Country Manor Acres. Also, call or email us at 865/448-9652 or countryventures@bellsouth.net to receive our full “Come Tour With Us” e-file designed especially for our brides. Or call or email to schedule your own private tour of our property and facilities – with no obligation and no fee. If you book your wedding and/or reception at Country Manor Acres, we have vendor’s list, equipment list and services, layouts and planning options, time lines, and decorating ideas, and many more tools to help you plan your wedding and reception to exceed your expectations. Destination Honeymoon Weddings, Elopements and Vow Renewals are a specialty at Country Manor Acres. The Rock Garden or the Veranda are generally selected for small, intimate destinations and honeymoon weddings. Those sites are close to or part of the Inn on the highest elevation and afford the most panoramic views. Special packages that include wedding and lodging for two are itemized in the News From the Country Link at the bottom of this web page. Our Hay Loft Sky Cabin with superb mountain views is unique lodging above the barn. Its rustic and charming but full of amenities, including a large deck with hot tub, picnic table, barbecue grill, plus a full kitchen and large dining area. Imagine your reception on the private 50-acre estate, nestled into the hillside, or fill the Appalachian Party Barn with fun decor and musical sounds for a guaranteed fun time. Load up the beverage shed and start up the music and your reception can be everything you dreamed it might be. As members of the Blount County Wedding Professionals Association, we have experienced caterers, photographers, cake decorators, florists, ministers of all denominations, and decorators we can refer you to. We feel they would be attentive to your desires as well as your budget. However, you are welcome to provide your own vendors who will work closely with us to assure your wedding is as perfect as possible. See our News from the Country for Special cakes, centerpieces and vintage or country decorations.